Magic: The Gathering Arena has the potential to completely dominate the collectible card game genre. Based on Richard Garfield’s mammoth trading card game, Arena is an attempt to craft the “deepest, richest digital card game on the market,” but there are some tall hurdles it has to clear before it can do that. 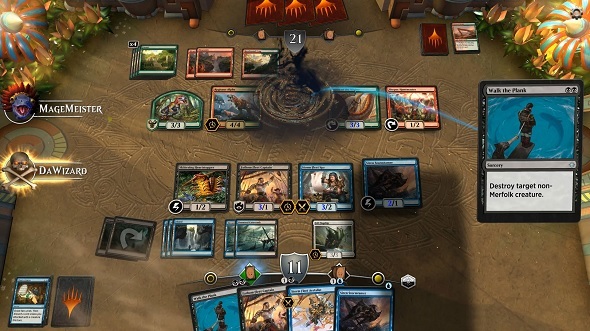 Magic: The Gathering Arena should make our list of the best card games on PC. Currently, Magic: The Gathering Arena’s focus is on the widely popular Standard format – in which two players build a 60-card deck out of the cards from the previous three seasons of expansions (or, as Magic’s creators call them: blocks). Restricting players to recently released cards means developers Wizards of the Coast do not have to worry about designing around every single card that has been released for MtG when working on new ones. Standard is extremely competitive, but given the strict card pool of this format it is limiting when it comes to effective deck construction – typically, there is a very rigid meta that funnels you into specific deck archetypes. We do know the Draft format will eventually make its way into Arena, which will help it enter the competitive scene, and will make for a good pairing with Standard in the game’s early days. But to really set the game apart the developers of Magic: The Gathering Area should look to the various community-made formats. The obvious addition is Commander – originally a fan-made mode called EDH (Elder Dragon Highlander) – which is a multiplayer format that has you construct a 100-card deck containing no duplicates and only using the cards that correspond with the commander who helms your deck. It is both a competitive and casual format that allows for plenty of deck customisation because you can pull cards from any point in Magic: The Gathering’s history. Implementing this format is a daunting task, so the team behind Arena could start off by incorporating the popular premade Commander decks that are available. These would be a great starting point especially if you could tune them to your preference with the pool of Standard cards. Commander is also a format designed to have four to five players in a single game, which would give Arena a larger multiplayer mode, setting it apart from Valve’s forthcoming 1v1 card game Artifact. 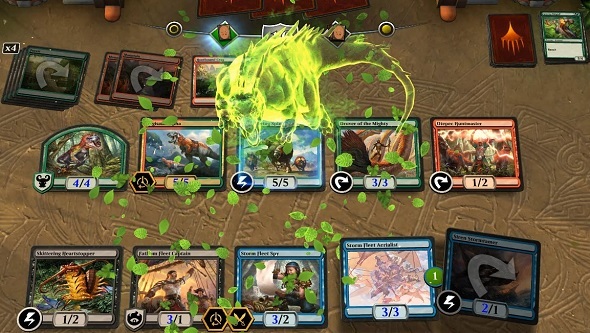 Along with Hearthstone, Artifact will be Arena’s biggest competition – especially since original Magic: The Gathering designer Richard Garfield is involved – so offering something different will be vital. Magic: The Gathering Arena should give us a chance to try the Pauper format, too, satisfying those looking for a more competitive spin on the game. Like other modes, you construct 60-card decks and try to batter your opponents down to zero life in Pauper. The catch is that only Common rarity cards can be used, which pushes you to think outside the box to achieve your victory. It is a wild format to play and one that has recently gained a tonne of popularity thanks to various community members pushing it into the limelight. Like Commander, Pauper allows you to pull cards from Magic’s long history, so long as those cards are Common. Pauper has the added benefit of using cards that are easier to obtain than Rares and Mythics. Both of these eternal formats will help Magic: The Gathering Arena maintain and grow its player base since cards in the Standard blocks will eventually rotate out. This means, in a few months, when a new set drops, both Kaladesh and Aether Revolt cards will no longer be legal to play. Having both Commander and Pauper ensures that all of the cards you have collected will not go to waste. 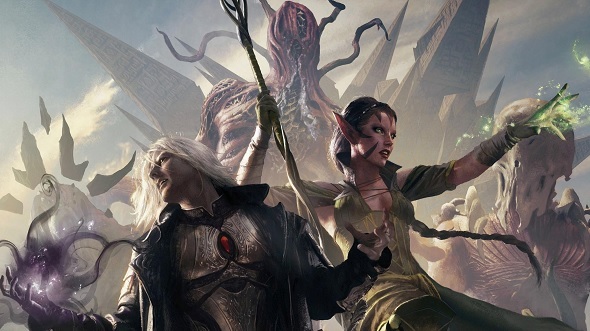 Plus, the current way to play these formats in digital form – in Magic: The Gathering Online – features a UI that is clunky and could do with being streamlined. Combining the fresh, slick look of Arena with these formats should produce plenty of long lasting and memorable experiences.